The following explanations of core terms in transdisciplinary research are meant to guide readers who are not familiar with transdisciplinary research or who are confused by the variety of meanings given to terms. 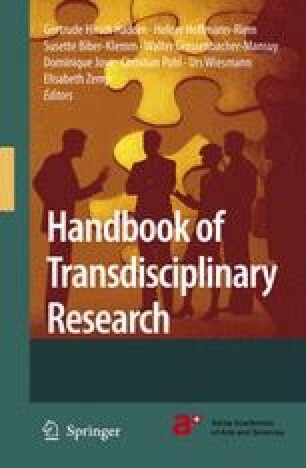 It is important to keep in mind that the explanations refer to the use of terms in the context of transdisciplinary research – they do not provide general definitions. For instance the meaning of ‘actor’ as described below may not hold from a sociological or psychological perspective and is wrong in the context of a theatre. The explanations are taken from the ‘Principles for Designing Transdisciplinary Research’ (citeauthor*ch28:pohl2007, citeyearch28:pohl2007) and from the Handbook (Chapter 2). Authors of the Handbook were invited to refer to a preliminary and shorter version of term descriptions when writing their contributions, but they were free to use the terms in their own way.